HLNT has appeared on our watchlist in the past, and is sporting one heck of a chart. HLNT pushed to a new high yesterday on twice the average 3mo. volume; this stock has entered blue-sky breakout territory. As you can plainly see on the chart, HLNT has absolutely been on fire. The last time this appeared on our watchlist was July 2nd, at which time the stock was as low as .0046. ICNB had its third consecutive day of gains since we’ve been following it last Thursday. Nokia is another one that we began mentioning Thursday’s Extended Watchlist, after the stock had recently seen its 52-wk low. NOK has been gapping up 2-5% each day we’ve had it on our radar, and today seems no exception. Key resistance should come at the 50DMA of 2.33, and if a break above that point occurs, we could see substantially more gains than the recovery process here has already provided. We’ve covered TLON since July 11th. At the time we stated “TLON is likely to become a target for many investors as we approach August 12, the company’s FDA PDUFA for their Phase III drug candidate Marqibo.” The stock was trading at 1.28. This play, new to our newsletter yesterday, managed a possible gain of 100%, after seeing a low of .0002, and subsequently closing at .0004. That’s an unbelievably positive first-day showing. BBDA has been holding support at the 20DMA (.0025).We are now looking for a break of .003. The next major resistance comes at the previous high of .0039. We like that it has been trading in a tight channel between .0025 and .003. This stock has been on our radar for some time now, and will remain there for the foreseeable future. 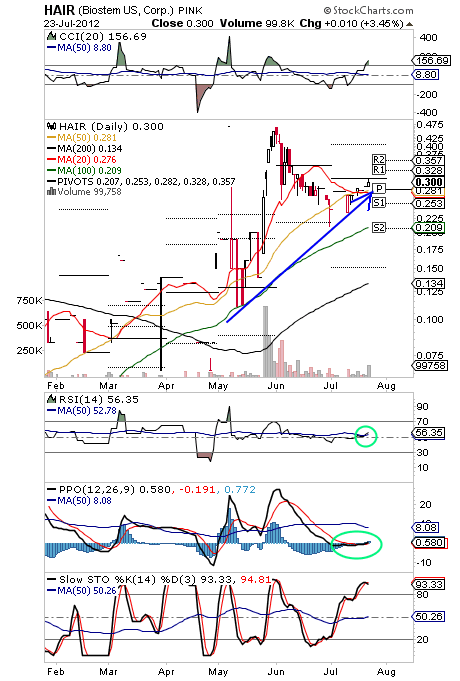 AAPT has been hovering around the .018-.023 range for the past couple of weeks. The chart on AAPT indicates a crossing PPO. Should the stock manage to break the 20DMA (.0221) & 100DMA ( .0266), there’s a chance that the stock might make a run at the 50DMA of .0341. We like this stock, as well as the company and products behind it, and will continue to monitor it going forward. We try to bring you a nice selection of quality picks on a daily basis, and believe us, we are well aware of our competition. There simply isn’t another stock newsletter out there that has our level of continual success, coupled with concern for our readers’ success. Anywhere. Despite receiving FDA approval for their new drug, AMRN appears to be gapping down this morning. After all of the hype and baked-in PPS leading into the approval date, it appears the stock now wants consolidate. Excessive profit-taking in these instances can hold back the progress of a stock, so we will be observing for any possible bounces. BEDMINSTER, N.J. and DUBLIN, Ireland, July 26, 2012 (GLOBE NEWSWIRE) — Amarin Corporation plc (Nasdaq:AMRN), a biopharmaceutical company focused on the commercialization and development of therapeutics to improve cardiovascular health, announced today that the U.S. Food and Drug Administration (FDA) has approved Vascepa(TM) (icosapent ethyl) capsules (formerly known as AMR101) as an adjunct to diet to reduce triglyceride (TG) levels in adult patients with severe (TG greater than or equal to 500mg/dL) hypertriglyceridemia (very high triglycerides). On June 18th, we alerted ACI as a bottom-fishers dream, and the stock subsequently ran from a low of 5.41 to 7.63 for a gain of 41% The stock saw a new low yesterday (5.16), and again seems like a good one to watch for a possible upcoming bounce. AKS is exhibiting some similar characteristics to ACI. The charts are alike in many ways, and like ACI, AKS is hovering around a bottom. Therefore, we want to keep an eye on it moving forward, in the event that it matches the kind of bounce we saw in ACI. Our interest in RENU has been renewed. Yesterday, the stock was able to break resistance at the 50 & 100DMA’s as we had expressed hope for in our morning report, touching .004 at one point. Being as low as .0015 last week, gains on the order of 167% were possible. As you can see on the chart below, the RSI has surpassed the 50-line and the 50DMA. The blue bars on the histogram flipped up to the bullish side, we can see a PPO crossover, and the Slow STO has passed through the 50MA overlay. All of this on increasing volume, leads us to a bullish opinion of RENU. Just a reminder, TLON has an upcoming FDA date on August 12th. NEW YORK, Jul 25, 2012 (BUSINESS WIRE) — Iconic Brands, Inc. (Iconic) (OTCBB: ICNB) announces corporate updates as related to ongoing operations and forward looking plans. As previously announced in September of last year our wholly owned subsidiary, Iconic Imports Inc. was forced to file chapter 7 bankruptcy when a senior creditor foreclosed on the subsidiary assets. The bankruptcy hearing has been held without claim and is pending discharge. There is no effect on the capital structure; the company maintains approximately 52 million shares outstanding with approximately 20 million in the public float. The FDA will rule on HZNP’s RAYOS modified-release low dose prednisone. We have done considerably well with HZNP leading into today’s upcoming verdict, thus, it may be a good idea for us to take profits off of the table, in the event of no approval. IDOI has been on fire of late, doubling in value over the past three trading sessions, with four consecutive green days in a row. Normally at this point, we would consider taking profits off of the table, however, we feel that there is still potential for added gains here. In instances such as this, when our money has doubled yet strength remains, we are likely to sell half of our position, and play the rest with the house’s money. After a recent 597% run from the .06 area to .46, HAIR has consolidated, and been making higher lows off of support in the low .20′s. Just in the past week, the stock got above the 20 & 50 day moving averages, leading us to believe that another run is in the making. There are also several indicators on the chart which suggest that HAIR has some real potential for growth (no pun intended!). HZNP has appeared in our watchlist recently. Yesterday, the stock was up 7%, and appears as if it may gap up this morning. With the company’s FDA PDUFA date approaching on Friday, we certainly want to keep a close watch over HZNP in the next few sessions. AMRN’s FDA date is this Thursday, one day prior to HZNP’s. We are watching closely here as well. TLON’s date is coming up in a couple weeks (08/12/12), so there isn’t as much of a sense of urgency just yet, but we will still be following along as zero-hour approaches.